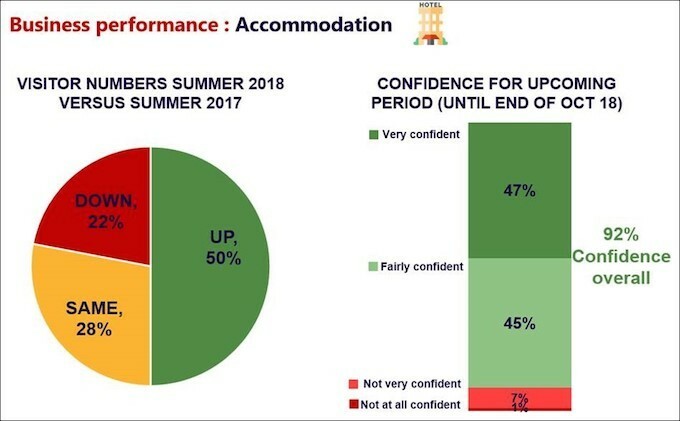 The newly-published research also asked about the expected performance of those accommodation businesses surveyed from the end of the summer holidays until the end of October this year. It showed that 92% said they were confident about their business performance during the stated timeframe. Sixty-seven per cent also reported good or very good advance booking levels until the end of next month. Findings from the research showed that the increase in bookings during the summer holiday period came from both domestic and overseas visitors. Looking forward to the rest of 2018, more than half of the accommodation providers surveyed (52%) expected their performance to be better than in 2017.